In 2011, the Canadian NASCAR Series was in its fifth season. With Canadian Tire as the primary sponsor, NASCAR had developed a successful format that attracted competitors and fans. There were many changes to the 2011 schedule. First, the season would consist of twelve rather than thirteen events which was the case from 2008 to 2010. The second half of the year mirrored 2010. St. Eustache and Edmonton were dropped in 2011 and a new venue, ICAR was added. The title chase started in May at Mosport Speedway and was followed by the series’ latest addition, ICAR. 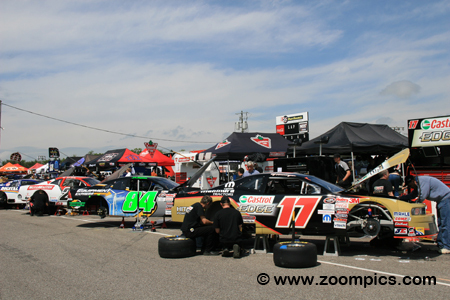 The championship stayed in Ontario for the next three rounds – Delaware Speedway, Mosport International Raceway and Exhibition Place, Toronto. After this stop, competitors would make a west coast swing - racing at Vernon, British Columbia and Saskatoon. Then it was back to the east for weekends at Trois-Rivieres, Montreal and Barrie. 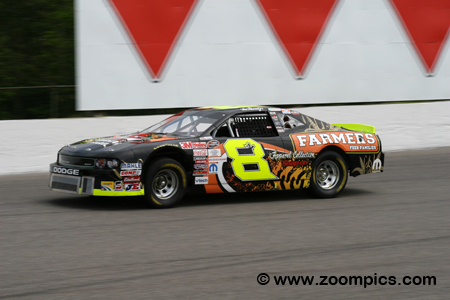 The penultimate round was held at Antigonish, Nova Scotia and the championship would end in late September at Kawartha Speedway. In total, there were twelve race weekends and the series would visit twelve different tracks in five provinces. and, there would be three attempts at a green-white-checker-finish before officials would end a race. For the first time in series history, the season would open on the 0.5-mile oval at Mosport Speedway. The race sponsored by the clothing company Dickies would be two-hundred-laps. 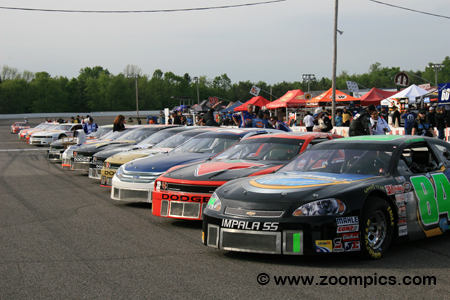 Nineteen competitor’s line-up on Mosport Speedway’s front straight for the first event of the 2011 NASCAR Canadian Tire season. Starting on the pole is J.R. Fitzpatrick in the Equipment Express Chevrolet. Next to Fitzpatrick is the No. 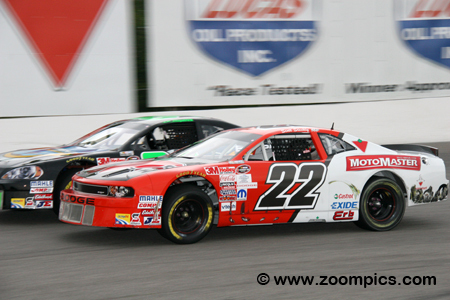 22 Canadian Tire/Motomaster Dodge driven by the 2008 series champion, Scott Steckly. Rounding out the top-five qualifiers are Steven Mathews, D.J. Kennington and Pete Shepherd, III. 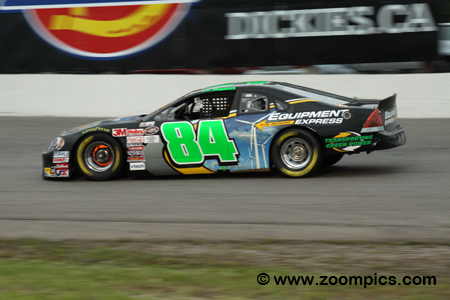 The 2008 NASCAR Canadian Tire Series champion, Scott Steckly started on the outside of the front row. It wasn’t until lap-58 that, he moved into first place. Steckly showed his speed and lapped all but five cars by the mid-point of the race. A faulty air gun during a pit-stop caused him to lose five positions. Steckly charged through the field and regained the lead on lap-157. He won by a margin of 0.865-seconds. Unless more funding could be obtained, Pete Shepherd III would be participating in the NASCAR Canadian Tire Series on a part-time basis. Shepherd always made the most of his opportunities – at this event last year, he finished fifth. He recorded the fifth fastest time in qualifying driving the National Exhaust / HY-Tech Dodge. 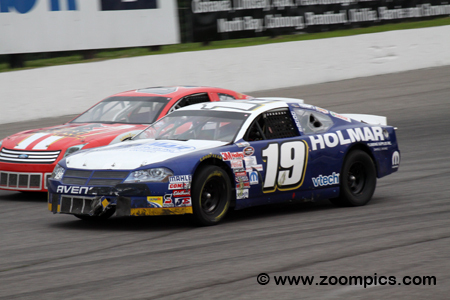 Shepherd led a total of twenty-four-laps but could not hold off Scott Steckly and finished second. 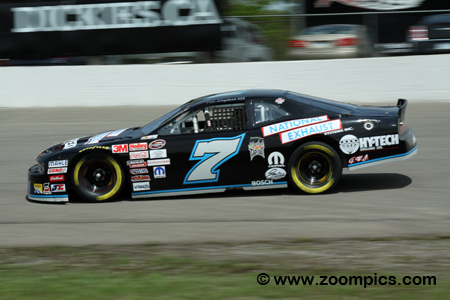 Don Thomson, Jr. had won two of the four races held Mosport Speedway but, he was charting new territory this year. In the off-season, Thomson left Fitzpatrick Racing and joined the Ed Hakonson team. The change also meant a switch from Chevrolet to Dodge. It appeared that he made a successful transition. Thomson started ninth and despite brake issues during the contest, he finished third. The reigning NASCAR Canadian Tire Series champion, D.J. 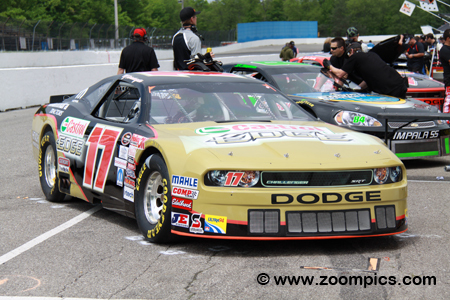 Kennington returned in 2011 with the Castrol Edge sponsored Dodge. Last year at Mosport Speedway, Kennington started on the pole but could only manage to finish in sixth place. This year Kennington qualified fourth quickest and led a total of twelve-laps before finishing in the fifth spot. 2010 series runner-up, J.R. Fitzpatrick scored his seventh NASCAR Canadian Tire Series pole in the season opener at Mosport Speedway. Fitzpatrick led the first ten laps of the race before surrendering first place to the Bill Mathews Motors Ford driven by Steven Mathews. He was never a factor again and slid down the race order to finish in seventh position – the last car on the lead lap. In the first two-years of the NASCAR Canadian Tire Series, Brad Graham competed in all the races but by 2009, he was participating on a limited basis. The Dodge driver with backing Holmar Plumbing was gridded fourteenth for the start of the Dickies 200. During the contest, Graham made significant progress and at the checkered flag, he was in fourth place. 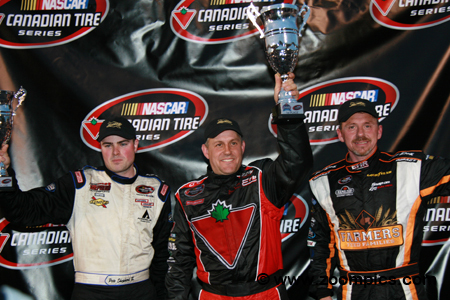 The top-three finishers for the 2011 Dickies 200 at Mosport Speedway. In the center is the 2008 NASCAR Canadian Tire Series champion and race winner, Scott Steckly. To Steckly’s right is the runner-up, Pete Shepherd, III. And, rounding out the top-three is the driver of the No. 8 Farmers Feed Families sponsored Dodge, Don Thomson, Jr.